Great weather, great housing, awesome schools and fun things to do-that’s Avondale, AZ! This modern city in the heart of the Phoenix Metro Area has been growing in popularity and resident numbers for the last three decades. No matter if you enjoy outdoor activities such as hiking, golfing, biking or swimming or prefer fine dining and great shopping, Avondale has it all. Additionally it is home to the PIR (Phoenix International Raceway) and proud host of two NASCAR races every year. Avondale-anything but boring. If you live or work (or maybe even both) in Avondale and surrounding communities you need to work with a roofing contractor you can trust and who knows the area and the demands the hot Arizona climate and wet monsoon season places on Avondale roofing structures. Arizona Roof Rescue is locally owned and operated by Alan Monzon. He has been roofing for several decades and is proud to be part of the fantastic Avondale community. No matter if you are in need of repair for your Avondale roof, maintenance or roof installs, Alan and his team can help. With top roofing services and great prices, they are the top choice for all your Avondale roofing needs. If you are dealing with shingle roof problems, you want a roofer who has experience with shingle roofs-it’s as easy as that! And our Avondale shingle roof contractors have been working on and with shingle roofs for many years. We understand the effects of the Arizona summer on your roof shingles, how to fix issues, replace entire shingle roofs and how to ensure that your Avondale roof shingle will have the best lifespan possible. We can assist you with finding the roofing shingles that fit your style and the needs of your home. There are so many different options available today, but we can help to take the guesswork out of shingle roofing. If you are dealing with Avondale shingle roof problems, call us today! While shingle roofs may not be as durable as some other roofing options, they remain the top choice for Avondale homeowners. Shingle roofs have come a long way in the last decade and are now available in a multitude of different color options and style variations such as architectural (dimensional) shingles, wood shake shingles, 3-tab and many others. If you are unsure which type is best suited for your home, our Avondale shingle roofers can assist you in choosing the right one. Shingles are popular, because they are affordable, stylish and lightweight and oftentimes are easy to repair. Learn more about roofing shingles by calling today. Is your shingle roof leaking or missing some shingles? You may be in need of Avondale shingle roof repair or replacement. Our experienced roofing crew will determine if your roof can be repaired or is too old and too damaged and needs replacement. We then explain the issue in depth to our clients so that they can make an informed decision and are in charge of what is going to happen to their roof. Our Avondale shingle roofing services are performed by experienced Avondale roofers and are extremely affordable. If you are looking to upgrade your shingle roof, Arizona Roof Rescue has many options available to you. Shingle roofs are a fantastic choice for Avondale homes. Their stylish properties, decent lifespan and affordability make them an extremely attractive roofing choice. 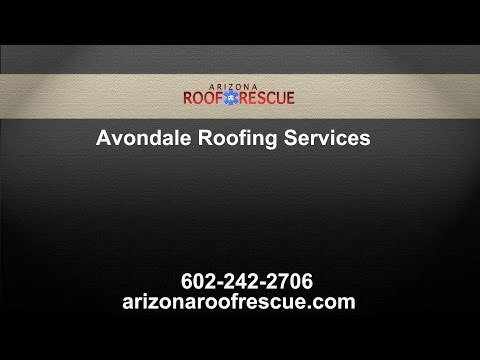 However, if the last monsoon storm has blown of too many shingles and left you with undesirable roof leaks, or you are planning on having your roof reroofed or upgraded with tiles, for example, you need an experienced and affordable Avondale roofing contractor such as Arizona Roof Rescue. We have been performing residential and commercial roofing services in the area for many years. Don’t let roof leaks slide. Regular roof maintenance and inspections performed by your local Avondale roofing contractor can help to detect problems early and prevent small problems from turning large and expensive later on. Our roofing crew treats every roof is if it was their own and takes great care in giving all pertinent information to our customers to enable them to make informed decisions about the future of their roof and home. Call us today to schedule a roof inspection, a shingle reroofing installation and to learn more about our comprehensive roofing services. You can reach us at 602-242-2706.